Chirin no Suzu which is “Ringing Bell in English” is an 47 minute Anime from 1978 produced by the one and only Sanrio. It’s a dark tale about revenge for children that begins with the super cuteness that sanrio brings with its name. Think Unico and Hello Kitty. Chirin is a lamb whose mother is killed by a wolf. He then seeks out the wolf in order to become strong and seek revenge. Along the way he must learn about the unfairness of life and how hard it can be. For one, Chirin was so set on becoming a wolf that he showed his detication by following the wolf. One example in Claymore, Clare follows Theresa and in turn Raki follows Clare with gratitude. In both cases neither Clare or Thersa wanted the child tagging along, the same as with the wolf. Eventually they develop a sort of respect for the strength, stamina, and spirit it shows to follow them around. They then accept the follower. Another commonality is attacking with the head. Granted, Chirin is a sheep and has either hooves or his head to attack with, he was charging through trees. How hard can a head be? It’s like Goku in Dragonball who defeated enemies with his hard head. Also, like in Dragonball Z, the wolf is a strict master very much like Piccolo. I wonder if Sanrio came out with anything nearly as dark or sad as this again. This was truly a tragedy. Revenge is a dangerous thing that hurts the avenger, possibly more than they were hurt at first. Another tone in this short movie is the danger of non-conformity. Chirin is not and never has been like the other sheep and look what happens to him. He seeks strength (as they seem to do in every anime) and gets it but at what cost? and Amanda Hugginkiss. How about the parents who named their children after diseases like Cholera or Mumps. Then parents have named their children after the seven deadly sins and Lucifer. Apparently the Homunculi in Fullmetal Alchemists don’t have oringal names. What kind of parents would do this to their child? There’s more at The Worst Baby Names of All Times. I hope your parents named you well. If they didn’t or if you know of someone with a terrible name just post it here. There are strange instances all over the globe of people copying Death Note or at least attempting to. Elementary school children in Korea are now writing hit lists of all the kids they don’t like. China banned Death Note, but I’m sure kids can still find the manga. As bad as it is in Asia, people in the Belgium seem even crazier about Death Note. Some crazy person dismembered someone and then wrote watashi wa kira des , which means they mispelled desu. Watashi wa kira desu means I am Kira in Japanese, which was the name that Light used as an alias as he killed people. Now crazy people are using Death Note as a reasoning and method to kill. In Death Note Light, the main character, is basically a bored genius who thinks he can make the world a better place by killing all the bad people in it. This idea could be appealing to people not in their right mind. This could be one reason why China does not want Death Note in the country. Another reason would just be that they do not want undue Japanese influence on their youth. And who else seems to have been influenced by Death Note besides Korean students and crazy people? Madonna of course. Her outfit in the music video Jump which takes place in Japan looks very much like the clothes of the character, Mello. Mello is in the picture below. Do you see any similiarities in hair and clothing style or am I just making things up? All types of people have been influenced by Death Note. As long as you don’t try killing people or get a very pessimistic view of the world I guess its okay to be influenced by this manga. An anime, two movies, and an L spinoff with possibly more on the way has been made. In Xmen the animated series, that ran from 1992 to 1997 on Fox Kids there were several incidences of slavery. There is even a mention of a love slave and this show was targeted to children. In the episode slave island in the first season, Gambit, Storm and Jubilee go to Genosha where they are forced to become slaves. They are also forced to wear slave collars which show up in later episodes. In captive hearts in season one Callisto of the Morlocks tries to keep Cyclops as a love slave. She says that she wants a strong man who doesn’t nessarily have to fight, because all she wants from him is an heir. Children don’t know what love slaves are and don’t need to know about them either. It’s good for children to know about slavery and that its wrong, but they shouldn’t know about love slaves. Mostly that went over the heads of children, but is it a good thing to show kids something over their head in cartoon? Its fine for a cartoon that is not targeted to children, but X-men is. 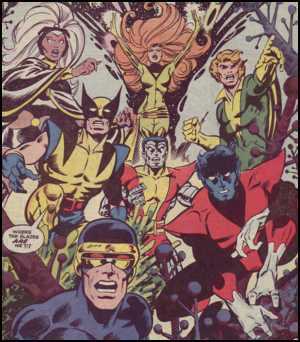 Was X-men originally supposed to target teenagers and was given a time slot for children just because it was a cartoon? It did air before adult swim, so maybe they didn’t know they could market cartoons to teenagers and adults.